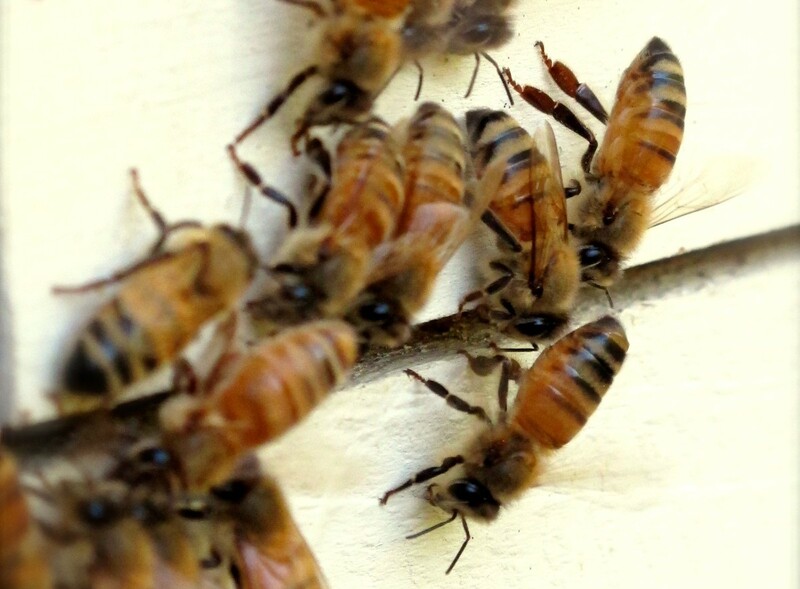 Honeybees are vanishing. Whether due to illness or infestation, GMO corn, or other environmental or genetic problems, the bees are in trouble. Part of the effort at Lucky Duck Farm is not just to keep bees for honey and pollination purposes, but to preserve them for their own sake. They do so much for us, including pollinating most of our foods crops. And no food means no people. Let’s hope we never have to face the world without them. 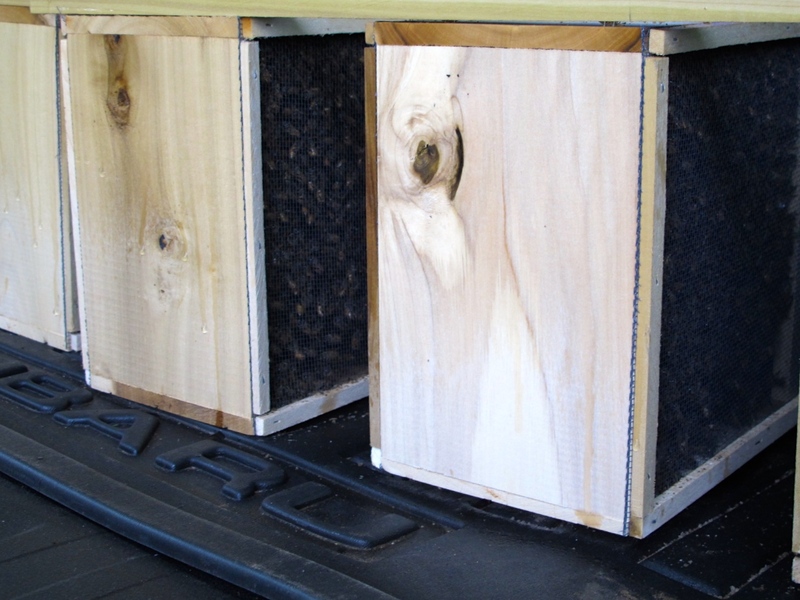 Bees arrive in screened wooden boxes to the local beekeeping supply store for customer pickup. You bring them home, praying the whole way none escape! 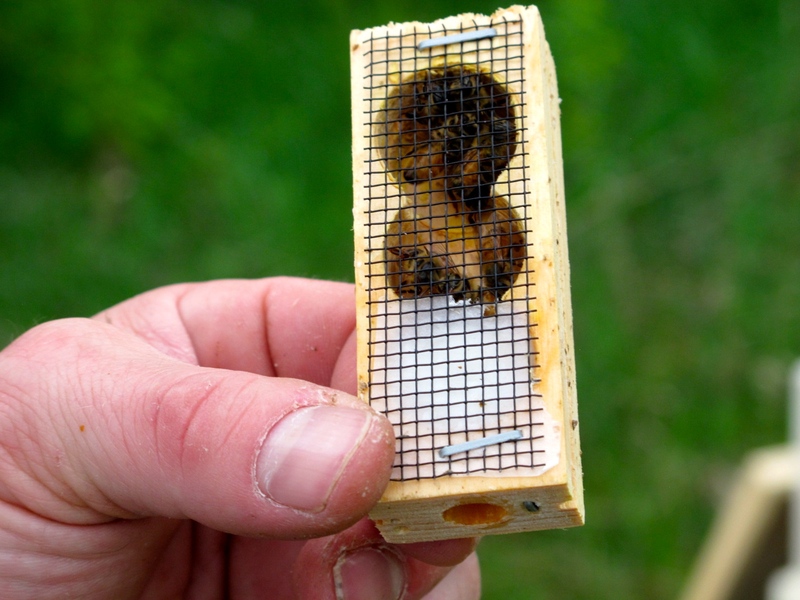 Queen bees arrive in their own personal little cage. Protected from the other bees on first introduction to a new hive, they must eat their way out, allowing worker bees to become used to their scent. Beekeeping is serious business, but it’s a lot of fun, too. And while keeping them isn’t rocket science, it’s more complicated than you might think. There’s a long list of things to consider and learn about bees before deciding to take on the job of keeping them. There’s equipment to buy or build, including hive bodies, hive tools, and a functional (if not fashionable) bee hat and suit. Finding a nearby beekeeping supplier is helpful for both equipment and advice. Betterbee in Greenwich, New York, is the go-to store in this neck of the woods. Worker bees build comb on plastic foundation frames. Here they are, busy as ever, when a hive is opened. Bees are generally accommodating when working with a hive. Applying a little smoke, and moving slowly and carefully go a long way in keeping them calm. But every now and then you will get an angry one (or two) who resent the intrusion. So before deciding to keep bees it’s important to determine whether you or anyone who’s going to be working with them is allergic, because at some point you will get stung. It’s not fun, but it’s not that big of deal for non-allergic folks. Bee venom has even been used as medical treatment, although it’s now considered somewhat controversial. Inspecting a comb-filled frame. 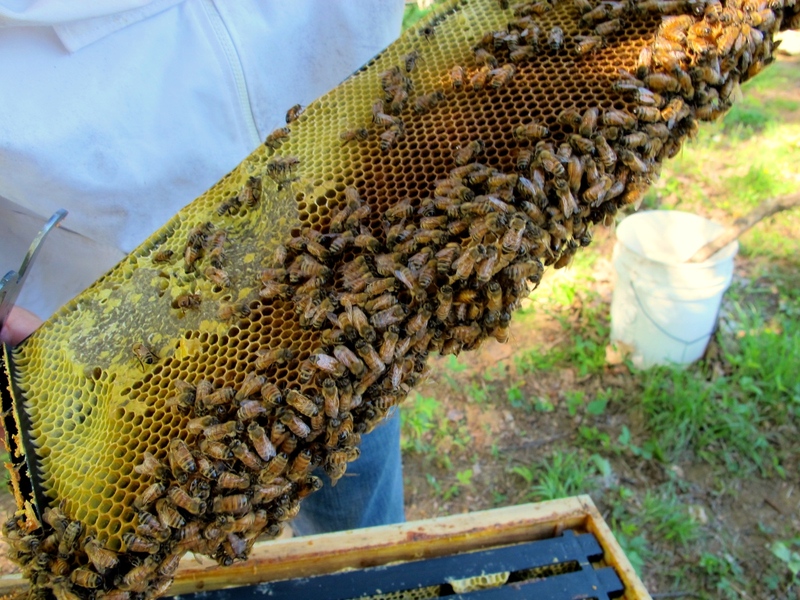 Comb can contain baby bees (brood), drones (baby boy bees), or pollen – it’s not just for honey! 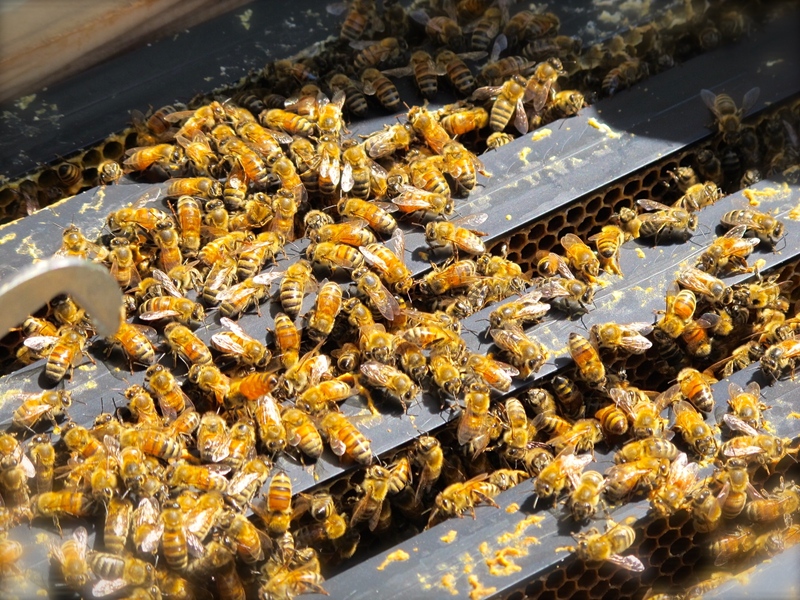 In the cold climate of the Northeast, beekeepers and honeybees face a few challenges. Between long or shortened seasons, opportunistic predators (bears, skunks, mice), and the ever-present threats of parasites (mainly Varroa mites, latin name Varroa destructor, appropriately enough), GMO food crops, and CCD (Colony Collapse Disorder), it’s not unusual for hives to fail. There are steps to take to prevent problems before they start, however, and it’s the beekeeper’s responsibility to undertake them. Starting off with the best hive placement possible is key. Like with any piece of real estate, you’re aiming for a good location: plenty of sunshine, high and dry ground, and protection from wind and snow. 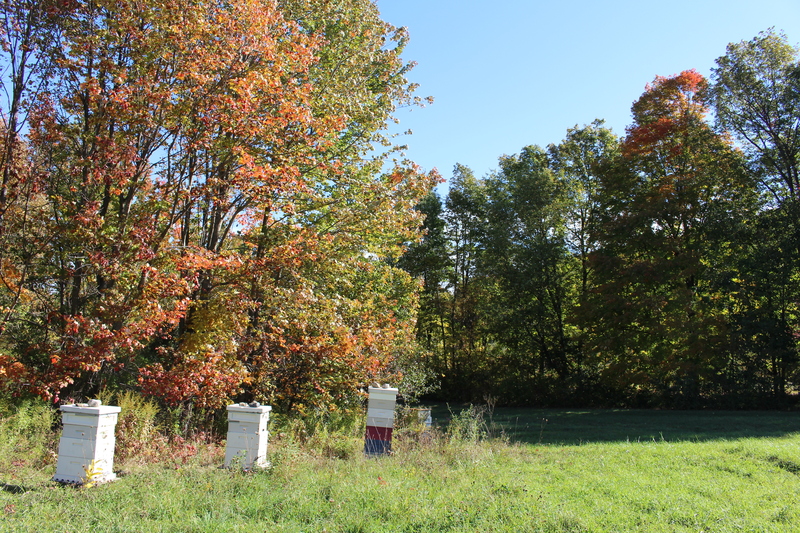 Getting bees well set up from the start makes a real difference in seeing a hive through season after season. Hives face south, southeast to make the most of the sun. Bees need lots of light for summer honey production, as well as winter warmth.